The girls have been sold short for far too long. While the boys have been singing along about girls looking good on the dancefloor or looked up to smackhead Doherty and his minions, the closest girls have had as a spokeswoman in recent years has been Avril Lavigne, and surely 40 year old male songwriters talking about Sk8ter boys and text speak doesn't really count. You'd think we were in the dark ages for the vitriol The Tommy's inspire simply by walking on stage. A caveman proclaims "Oh they're girls, is that their thing?" as if its the first time he'd ever seen a all-female band. Later on his girlfriend will sneer "17, that's how old they are then?" before snorting as if her comment has been the wittiest thing ever said. But while attitudes like this are bordering on the moronic the simple fact is there hasn't been a strong all female act out of the UK in years. While the US had Kittie we were getting over the end of the Spice Girls. All the strong female icons such as Sonya Madan and Louise Wener were more often than not portrayed as a bit of eye candy despite the fact that they were the brains behind the outfit. It would be all to easy to call The Tommy's a female Busted, and indeed the pop hooks are there, but perhaps the most justifiable comparison is they could well end up selling as many records as James Bourne & co. Closer inspection reveals them as a sugar-coated romp through the back catalogue of Hole & L7. Obvious and direct the songs titles say it all. "The Day The World Turned Chav", "Five Queen Star Of The Back Street", "17" are sneering look at what it's like to be young and female. "Did It Again" the most musically and lyrically evolved of the songs is a song that proves The Tommy's are more than just another rock band. By the end of the all too brief 30 minute set, they've won over the cynics and showed they have the potential to be the brightest hopes for 2006. 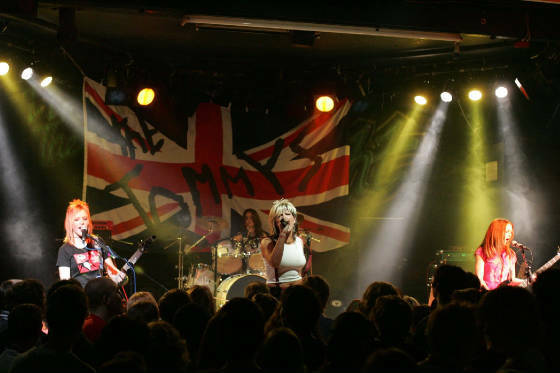 The Tommy's deliver timeless songs which could fit in with 70s punks, early 90s riot girl and noughties pop punk. A real revelation and a band set to raise the bar for next year.